If you’re moving in the next six months, the stress to get everything packed and prepared can feel overwhelming. What’s more, your stuff begins to stare at you whenever you come home each day the longer you wait to start packing. In fact, you may even consider hiring a packing and moving company, which takes the stress off you. But before you go and call Skyline Moving Company, review the seven moving tips we’ve put together for you. They will save you time, money, and your sanity. You know all those boxes in the garage you haven’t unpacked in years? Organize those first. Get them near the front of the garage and ready to be loaded onto the truck. Next, get boxes for each room of your home. Then, schedule 30-60 minutes every day at least 30 days prior to your moving date to pack. Granted, your home will be a mess for this 30 days, but you will relieve your own stress immensely, doing a little bit at a time. When you pack one room at a time, you save time and reduce stress. You can plan out your less frequented rooms first and pack your more frequented rooms as you get closer to your moving date. As you pack, it may seem like this takes more time than necessary to get the job done. However, when you start unloading boxes at your new residence, a clearly labeled box ends up in the appropriate room. A box that has no label ends up needing to be examined, which slows down the unloading and unpacking process. You want to get settled in your new home as soon as possible. Labeling your boxes helps you do just that. Most homeowners will use newspaper to wrap their fragile items before packing them away in a box. This works, but you need to be aware that the ink on the newspaper may bleed onto your items. Instead, go purchase white or “packing paper” to wrap your fragile items. You can go to your local home improvement store or call your local moving company and request to purchase moving boxes. There is a difference between the boxes you get from the stockroom at the grocery store and fortified moving boxes you can purchase. Some of your belongings won’t fit into a box or cannot be traditionally packed. Odd shaped workout equipment, furniture, and kitchen items may need to be set aside from the boxes so that they make it to your new home in tip-top shape. Family heirlooms, important paperwork or documentation, antique books, and sentimental belongings all deserve to be moved with care. It’s best to not pack these items and keep them nearby in the cab or with someone that will be able to hold them as they are moved to the new residence. You do not need to move your home on your own. The professional movers at Skyline Moving Company will help you get your belongings packed before your moving date, loaded onto the truck, and unloaded at your new residence with ease. You shouldn’t have to stop your life to move your home. 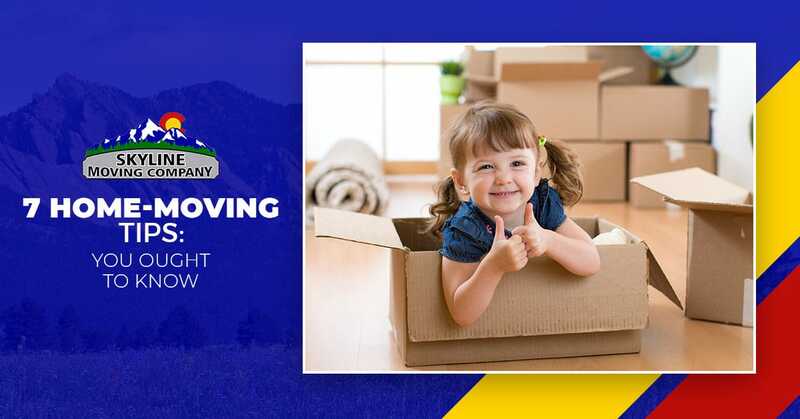 For years Skyline Moving Company has been serving northern Colorado with effective, efficient, and affordable moving services. We understand the stress and overwhelm that you may experience when you realize you will be moving your home soon. That’s why we encourage you to give us a call to get a quote on our moving services. We will work to make sure you get the services you need at a price you can afford.